If you work in print marketing or any sort of marketing for that matter, we’d always recommend getting clued up on different paper sizes and formats you’ll potentially encounter. In this guide we’re going to focus on ‘A’ and ‘B’ paper sizes. Read on for our paper size charts and a breakdown of how each paper size is typically used. Let’s start with the most globally recognised paper size convention, A. Formally adopted in Europe way back in the 19th century, the ‘A’ paper size system has since spread across the world. Aside from the USA and Canada, nearly every country uses this system now and it’s the most common standard business letter size used in English speaking countries. You only have to glance at your home or office printer and you’ll most likely see A4 paper poking out of it. It’s the paper size most commonly known and used for everyday printing. But there many more options available for print within the ‘A’ paper series, which goes from A0 through to A10. Our charts below gives you a visual of the different A sizes available but, we’ve also provided a summary on how each paper size tends to be used. 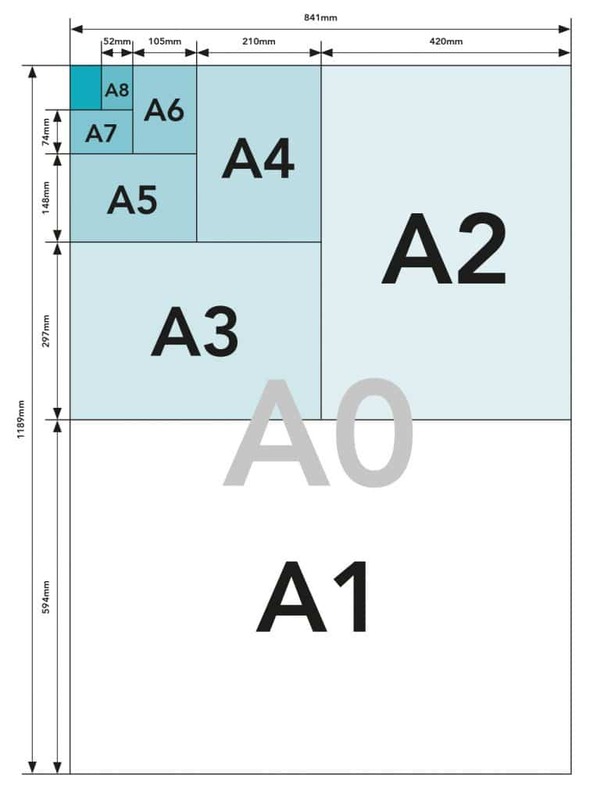 The largest standardised paper size in the A range, A0 comes in at over 1 metre in height. That’s the equivalent of 16 A4 sheets of paper. This size is typically used for large signs or posters. Like A0, A1 is typically used for signs, posters and window displays. A2 is used for posters, notices, window displays and art prints. A3 tends to be used for presentations, charts, posters and plans. 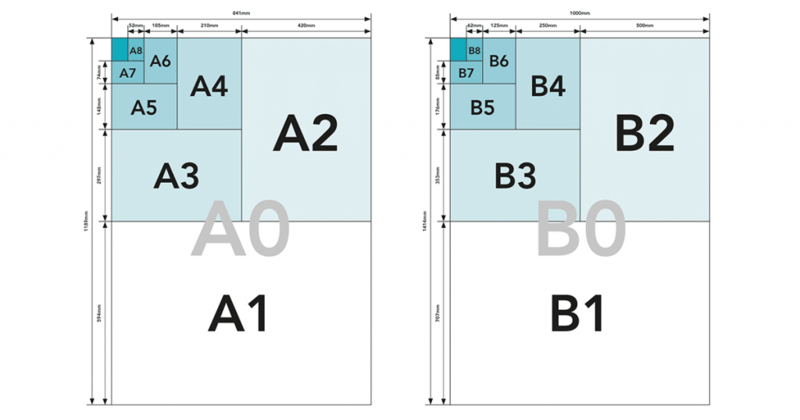 A4 is the most recognised ‘A’ paper size and is commonly used for everyday printing. A4 tends to be used to print business stationery letterheads. A5 has many uses. This size is a popular choice for diaries & planners, books, invitations, flyers, booklets and more. A7 tends to be used for large Post-it notes. It can also be practical for tickets, since you can print 8 of them on an A4 sheet. A9 tends to be used for vouchers and tickets. Being the smallest of the standardised A sizes, A10 is only ever really used for stamps or small vouchers. In addition to A sizes, naturally we have, (yes you guessed it) the B series. This paper series was introduced to provide a wider range of options. We’ll mention at this point that there is also a C series which is a set of envelope sizes. We’re not going to include the C series in this article but watch this space! The B series is that little bit bigger than it’s A counterpart. Again, we’ve given a quick overview of how each size is typically used. 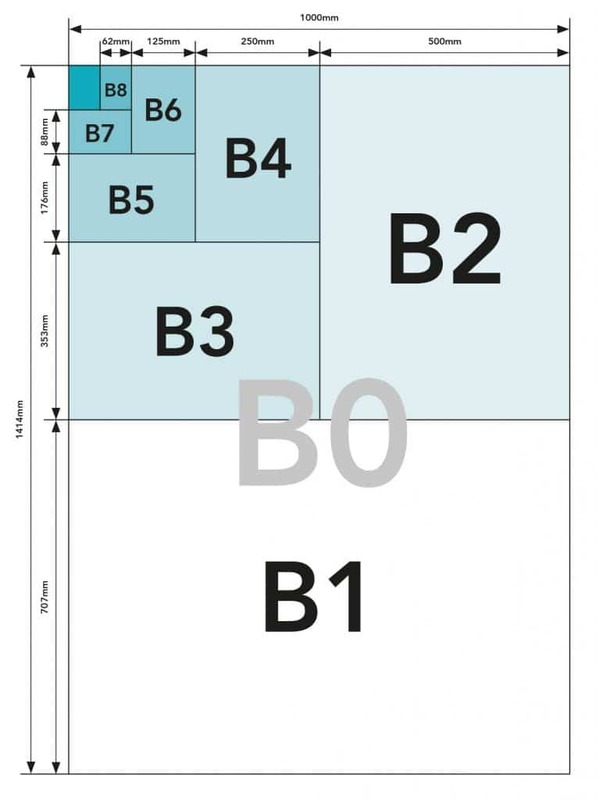 B paper sizes follow the same pattern as A with B0 being the largest and dropping in size by half as you go from B0 to B10. This size is typically used for posters and enlarged photos. B1 again tends to be used for posters and signs. B2 is perfect for small posters. This size is typically used for smaller posters and paintings. B4 works well for little posters and notes. B5 is a popular choice for menus, magazines and advertising flyers. B6 tends to be used for booklets and flyers. Small notebooks, menus and flyers – B7 is a good choice for these. This size tends to be used for flyers and business cards. One of the smallest B sizes, ideal for labels and small flyers. The smallest B size is mainly used for vouchers and small cards. Looking for a reliable supplier for your print marketing? Our experienced team are here to help you. Get in touch with us today to discuss your print requirements in detail. PS. we’ve popped these handy tables below to give you a breakdown of each paper size and its dimensions in millimetres, centimetres and inches.